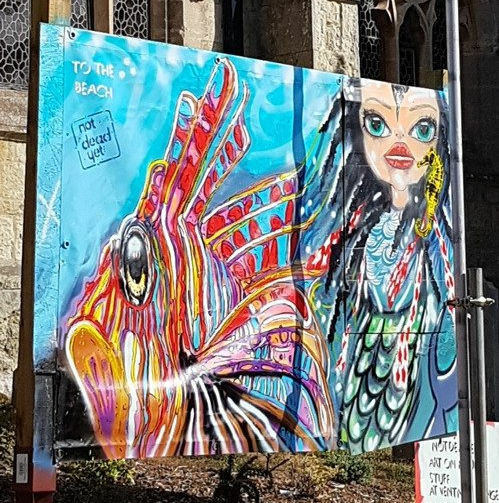 Ventnor might now be home to Phlegm’s Ventnor Giant, but has also this week been hosting the Ventnor Mermaid, created by Isle of Wight artist Not Dead Yet. Do you want to take her home? You’ve heard of the Ventnor Giant created by world-renowned street artist, Phlegm. Well in the same week we can also introduce you to the Ventnor Mermaid. 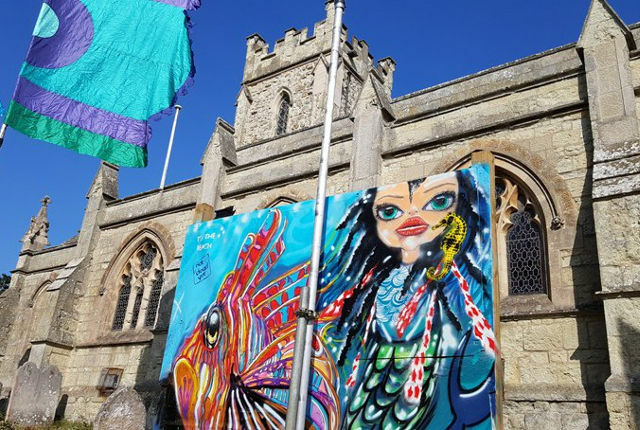 Prolific Isle of Wight artist, Not Dead Yet (aka Tony Trowbridge), was down in Ventnor for the Fringe Festival this week and created this great artwork during a live painting session at St Catherine’s church. Live painting at the Ventnor Fringe in the graveyard (a first for me) opposite Ventnor Fringe Festival HQ, Ventnor Exchange. The painting has been on display all week at St Catherine’s Church, collecting donations for the research into Motor Neurone Disease. She’s now moved to the former bus station on Pier Street. When the festival comes to an end tomorrow (Sunday), Tony will be giving the Ventnor Mermaid away. If you have a large enough space for the 8ftx6ft artwork get in touch with Tony via Facebook or Twitter. If you’d like to make a donation you can via Tony’s partner’s Just Giving Page. Fiona is also doing lots this year to raise money for Motor Neurone Disease Association, so check out her Just Giving Page for updates. 1 Comment on "The Ventnor Mermaid, created on other people’s rubbish by Not Dead Yet"
what a wonderful work of art. It is good to see talent such as this from a local artist. Does Not Dead Yet ever have an exhibition of his work?